E que tal as botas de cano bem alto e as over the knee? Confesso que a mim me agradam bastante e que as acho super elegantes, se coordenadas com as peças ideais e com a nota de estilo certa. No Outono 2013 a tendência vem em força e coordena-se com vestidos e saias curtas, tal como apresentado por marcas como Chanel ou H&M. Fica a dica! And what about knee high and over the knee boots? As for me, I confess that I'm very found of this trend, and find it elegant and stylish if coordinated the right way. 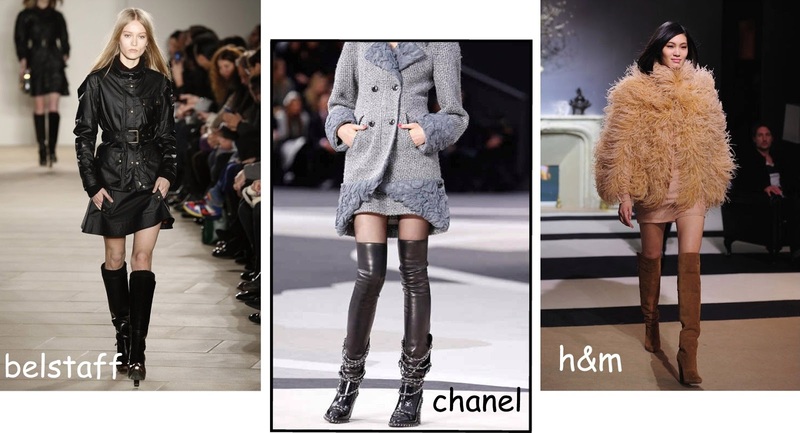 For next Fall, the trend comes hard and looks great with both short skirts and dresses, as seen in Chanel and H&M. Do You dare?